Five spacious bedrooms and five bathrooms make up Nirvana Villa, whose name fits perfectly with the home’s zen vibe. Everything here is modern and contemporary, from the villa itself to the furnishings inside and out. A large pool with a waterfall feature runs the length of the home, and concrete walls border the perimeter to provide tons of privacy for guests. A huge, green lawn with a garden area overlooks the surrounding island and the sea below, so the views are great from here or from up on the pool terrace. At Nirvana Villa, you have a private escape to use as a home base while you enjoy all that St. Bart’s has to offer. 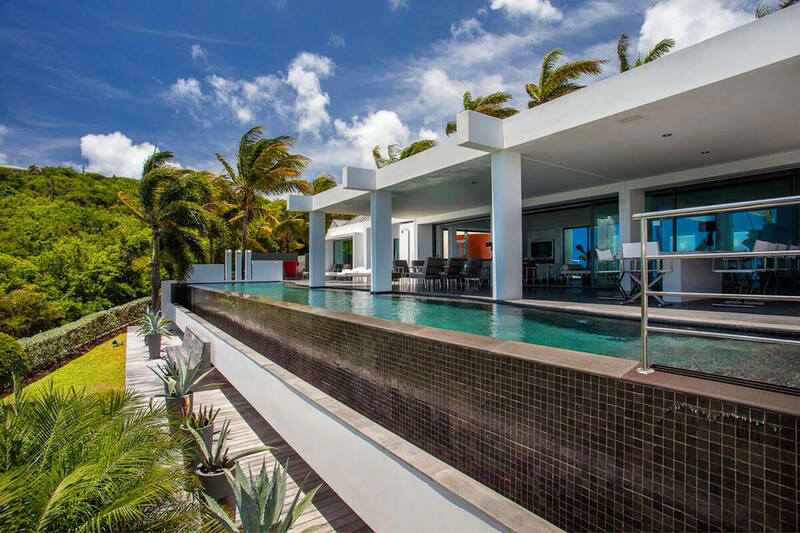 Ultra modern with stunning ocean views! At Nirvana Villa, you’ll find that less is more, in terms of the minimalism and simplicity of the materials that make up this upscale and private villa. Nirvana is a uniquely contemporary villa where design and art are king. You’ll find lots of calming greys and whites in the villa, with a splash of color here and there to offset it. The property is bordered by high concrete walls that give the bedrooms total privacy with views of the sea and the gardens. The bathrooms are spacious and relaxing, and just as well designed as the rest of the villa. The kitchen is perfectly modern and fully equipped, and the living areas feature comfortable contemporary pieces that invite relaxation. Outside, a lava stone pool is also decidedly contemporary with white concrete fountains, surrounded on the far side by a garden with coconut palms, a very green lawn, and eye-catching sculptures. Nirvana is zen, minimalist and irresistible in its unique and inviting design. *Please note that the manager lives below the villa with a separate entrance. *There are 2 more bedrooms under construction. Heated Infinity 22 meters lap pool. A/C in bedrooms	: + fitness room.